Today the digital camera is ubiquitous, but photos used to be taken by momentarily exposing something called "film" to light. Yes film, the ode to photo-sensitive chemical reactions that produced all of the pictures made before 1990 or so. Those images were, and quite of­­ten still are, transferred to photo paper and pasted into coffee table al­­bums. Sometimes they were processed into transparent 35mm slides and projected onto white screens for everyone's en­­joyment (or boredom, depending). But film isn't digital, and it degrades with time and exposure to the elements, albeit far more slowly than you might imagine. Fortunately for posterity's sake, it's easy to digitise and even restore some of the original luster of your film, using today's flatbed and film scanners, plus appropriate software. Most print/copy/scan multifunction printers (aka MFPs), such as Canon's Pixma MG8120, or Epson's Artisan 725 or Artisan 835, come with integrated flatbed scanners that are perfectly viable for photo scanning, though these integrated scanners are generally rather slow. 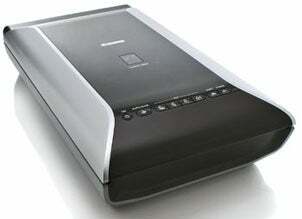 Canon CanoScan 900F This dedicated flatbed scanner can handle slides and film (MFP scanners may handle prints only). Dedicated flatbed scanners such as Canon's CanoScan 9000F offer greater resolution, quality, and features than MFP scanners, including the ability to scan slides and film. If you have a ton of slides to digitise, as I did, a dedicated slide scanner from Pacific Image or Plustek, or a film-scanning flatbed such as the aforementioned CanoScan 9000F is a necessity. Dedicated slide scanners are fast, they scan each slide in a fraction of the time that a flatbed scanner takes, but they're also slow in that you must insert or feed each slide individually. A flatbed scanner can scan multiple slides at once, and the scanner software does the cropping and separating for you, but the processing time for each scan is a bit longer. I've gotten great results with both. Scanning trays keep your film and slides in place. Note: Though you can scan multiple slides held in place by a tray, scanning multiple photos scattered about the deck isn't efficient. The amount of time you spend editing and splitting images into separate files will negate any time you save while scanning. All scanners ship with utilities that provide basic kinds of corrections such as deskewing (rotation) and cropping, as well as colour, contrast and brightness corrections. As a rule, these features work very well. But to correct flaws in the original media, such as water damage, rips and fold marks, you'll need an advanced, pixel-level editor. Adobe's Photoshop, currently at version CS5, is the choice of professionals for such work, though it's not for casual users. Photoshop Elements 9, from Adobe, provides a wide range of tools for fixing photos, and it carries a much lower price than does the full version of Photoshop. Adobe's Photoshop Elements 9 provides the same tools for fixing noise, dust and scratches, plus the sophisticated tools that PC World in-house photo-editing guru, Jeff Berlin, relies on for fixing image flaws. It's a better bet for home use. Be­­fore you buy anything, however, take a look at the free GNU Image Manipulation Program (GIMP). Despite the unfortunate acronym and a somewhat clunky interface, it's a powerful program that has nearly the same tool set as Photoshop, produces good results and as I said is free. You can save your scans in any number of formats. JPEG is the most commonly used, but it relies on a lossy compression scheme, so finer details might not survive. With today's capacious hard drives, it's easy to save your scans as compressed TIFF files that use lossless compression, and then convert those files to JPEG when the need arises. The better the condition of the original media and scanner, the better the scan and the less time you'll have to spend fixing problems. Keep the glass scanner bed clean with a static-free, lint-free, debris-free cloth. Nonabrasive wipes and film-safe cleaning solutions for cleaning slides may be found at photo supply stores. Often you can remove dirt from photos with a slightly damp washcloth, but test the viability of this approach on an unimportant photo or area of the photo, take it slow and be gentle. Better dirty than ruined. The air displaced when you lower the scanner lid disturbs the alignment of lighter and smaller documents and photos. But don't hold them in place with household adhesive tape, it's too strong and may damage documents. If you must tape, use artist's or tack tape, which is pH-balanced, leaves no residue and is easy to remove. And never tape a photo or document to the scanner glass, only to the frame surrounding it. Most scanner drivers or utilities select the best dots-per-inch resolution for a task according to the type of medium, striking a balance between reasonable file size and image quality, both of which increase as the dpi resolution goes up. For normal pictures and magazine photos, 150 to 200 dpi is generally fine, but 300 to 600, or even 1200 dpi may be in order for fine prints, for original art, or for situations where fine detail needs to be preserved. Film is a high resolution medium, so don't skimp on the dpi when scanning 35mm film or slides. Generally 1200, 1600 or higher dpi is in order. Try previewing at several dpi settings and see what works for you. Higher isn't always better. You can actually add distortion or artifacts such as cross-hatching or moiré if you exceed the optical resolution of your scanner.